ICS (Interactive Cooking System), an automatic cooking system for Italian, French, International, Spanish, Russian, Asian and German recipes including their history, ingredients, procedure, automatic cooking program and plate presentation. 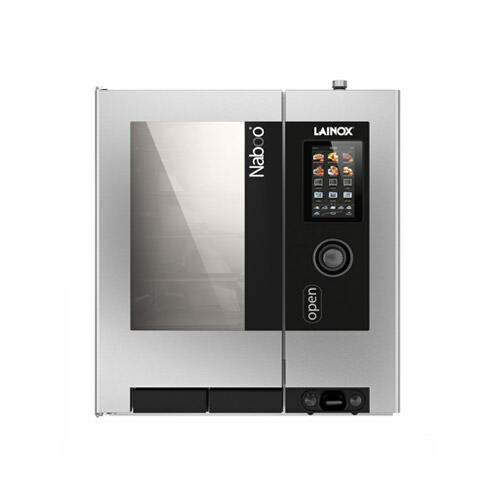 Manual cooking with three cooking modes: Convection from 30°C to 300°F, steam from 30°C to 130°C, combination convection + steam from 30°C to 300°C. Programmable modes – Possibility to program and save cooking methods in an automatic sequence (up to 15 cycles) giving each program its own name, picture and information on the recipe. Automatic cleaning system SCS, Solid Clean System (equipped with 2 cans of Solid Clean – 1 KG each). Calout descaling system (equipped with 1 can of anti-scale product solid Cal – 1 KG each). Built-in and retractable hand shower with tap. 2 stainless steel grids 12×20”.